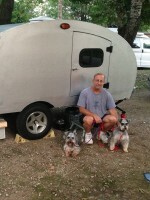 Teardrops n Tiny Travel Trailers • View topic - Good window size??? Well I am getting ready to order the windows for the doors and wanted to get your opinions. In the pic below I have attached a piece of hardboard to show what the actual window will look like mounted in the door. The dimensions are 12"x18". The windows are only $60 each so very affordable. Let me know if it looks proportional to you and weather or not it will let in addiquate air. There is going to be a fan in the ceiling directly between the windows....... Thanks in advance!!!! Greg, it looks great proportionately. 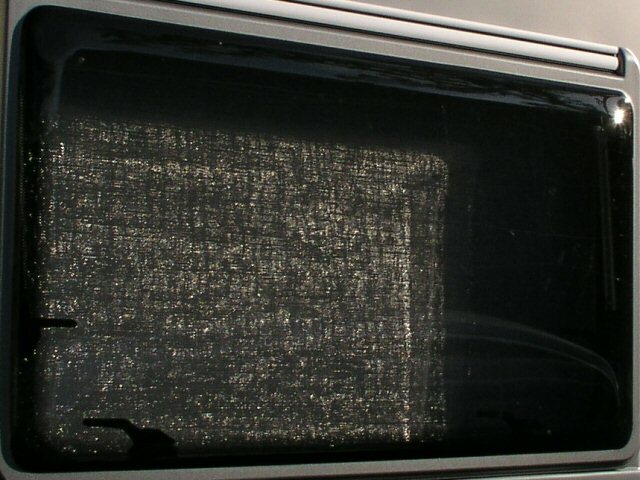 If it is like the windows in my van, the slider will allow a little less than half an opening. If you have an exhaust fan in the ceiling (exhaust was my assumption), that should draw a good amount of air into the enterior. But when it comes to ventilation, more is better than not having enough. I think you'll find the size you've chosen is pretty much in line with most of the tear builders on this site. Check with your supplier and make sure you are ordering those the right way... You say they are going to be 12" x 18". The glazing industry is pretty much standardized as listing width first and height second... there is a small contingient of suppliers that don't follow this rule though. By the looks of your picture, that would be an 18" x 12". I'd ask them if the vent glass is situated on the inside, in which most cases it is... That way you could put an OX on the street side and an XO on the curb side and get a little bit better weather protection with the glass overlap in terms of direstion of travel. Sliders are asthetically appealing, but I've been in rain storms where I would have had to close them.... I actually bought and had delivered sliders from jcWhitney and sent them back and got awing windows instead. In the dream vs. reality equation, I had to go with reality on this one. MadJack is right, I mounted mine vertically to get more air flow lower in the trailer. My idea was that it would keep you cooler at night in bed and so far has worked out OK. I would mention, however, I learned if you turn the windows oriented oposite from how they were intended to be installed, you will have to drill more weep holes in the bottom of the frames to keep them from leaking water into the trailer. I second Steve H's opinion on weep holes. Mine are in vertically as that's the way the weep hole was oriented. If I wanted to turn them 90 degrees (got from salvage yard so didn't have choice), I would have to caulk up factory gap and make a new one at bottom edge. Hope that makes sense. Hey, guys have been talking about mattresses and bedding on this board, guess we can talk about curtains too. At Spamboree 5 last year, I asked Karen Abbey, ibecrafter@aol.com., to pick out a decent pair of dish towels, add an embroidery of my tear and I attached them with Velcro. Simple and they work very well. Once she has the embroidery piece set up she can add it to any thing fabric that you want. I have mine on a fleece jacket also. You wife might make a better selection than I have but they work. IraRat wrote: COOL!!! A BEER HOLDER!!! Available at you local marine supply store.